JNN 21 July 2015 Washington : The United States and Cuba have formally commenced their full diplomatic missions after 54 Years , On Monday after restoration of ties. At midnight local time on Monday, the two countries formally resumed ties after 54 years and the Cuban flag was raised over the Caribbean state’s embassy in Washington. The American flag will not though be raised at the embassy in Havana until an official visit by US Secretary of State John Kerry to the Cuban capital on August 14. Hours after diplomatic ties were restored, Kerry visited his Cuban counterpart, Bruno Rodriguez, who had presided over the embassy reopening. The Cuban flag was also raised in the lobby of the US State Department, where it joined those of other countries that have ties with the US. US Assistant Secretary of State Roberta Jacobson was heading a delegation of the Obama administration at the inauguration, in which over 500 people, including a high-ranking Cuban delegation, took part. 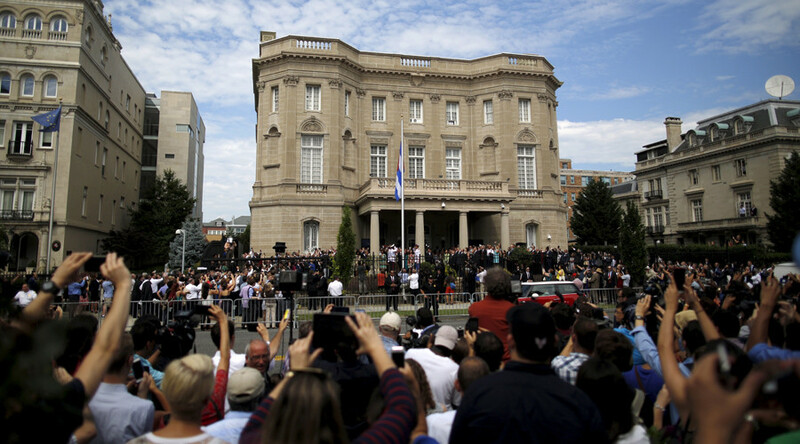 People also gathered outside the embassy as the Cuban national anthem was being played. There were a number of protesters among the crowd, at least one of whom was reportedly removed by police. On July 1, the two countries agreed to restoration of ties, however, serious differences yet remain including the US economic embargo and restrictions on Americans wanting to travel to Cuba. Rodriguez, for his part, renewed Havana’s calls for the removal of the 53-year trade embargo that Havana maintains has hugely damaged its economy. “I emphasized that the total lifting of the blockade, the return of illegally occupied territory of Guantanamo as well as full respect for Cuban sovereignty and compensation to our people for human and economic damages are crucial to be able to move toward the normalization of relations,” Rodriguez said as Kerry stood beside him. US President Barack Obama has been making efforts to ease sanctions on Cuba, which Rodriguez appreciated, but a full removal would need a green light from the US the president, where several Republicans have vowed to roll back the president’s moves on Cuba. The United States broke off diplomatic relations with Cuba in 1961. Washington imposed an official embargo against Havana in 1962, which still remains in place. The Republican-dominated Congress has so far refused Obama’s request to lift the longstanding embargo. This entry was posted in America, United States and tagged Bruno Rodriguez, Cuba, Cuban capital, Cuban Embassy, Cuban flag, embassy in Washington, Havana, John Kerry, US Em bassy, Washington. Bookmark the permalink.